3 x 5 Rolled Scroll Invitations | Scroll Invitations (Minimum 25) | Scrolls Unlimited, Inc.
--- Please Select --- Please do not burn the sides on my scroll! This size "Rolled Scroll Invitation" measures 3" wide by 5" long. They can be burned on the sides to give them an authentic, "Old Fashioned" look. 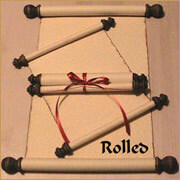 Make a real impression on all your guests when you hand them a scroll as a personal invitation! Our Colored Padded Envelopes can be used for mailing your Scroll Invitations. Add a little fancy by using our Sheer or Fabric Bags for an added impression. We promise you whoever gets one will LOVE them! There is a one-time set-up fee of $20 that includes the layout fee, three proofs and printing. Minimum order is 25 scrolls.